In this problem, teams rode on and drove original vehicles in an Odyssey-style triathlon. They had to score in “curling,” hit the right targets when “jousting,” and “run track” by navigating a course in two directions. Between these events, the team had to entertain the audience and the vehicle had to change appearance. In the outreaches of the universe, there is an Intergalactic Hangout where all sorts of creatures from different worlds stop, eat, refuel, and relax. Teams created a humorous performance centered on this science fiction hangout that includes original creatures, foods, and a search for space treasure. There was a worker character, entertainment, and a futuristic map at the hangout. Over the years, Odyssey of the Mind teams have designed structures that changed into many unbelievable shapes and sizes that balanced and held as much weight as possible. This year, teams turned their balsa wood structures into animals! Since animals need to eat, they must be fed. The structure had its appearance transformed and explained during an original performance. During the performance, the structure had to hold the team-created food while it supported weights. Our 6 teams worked tirelessly week after week on their problem. 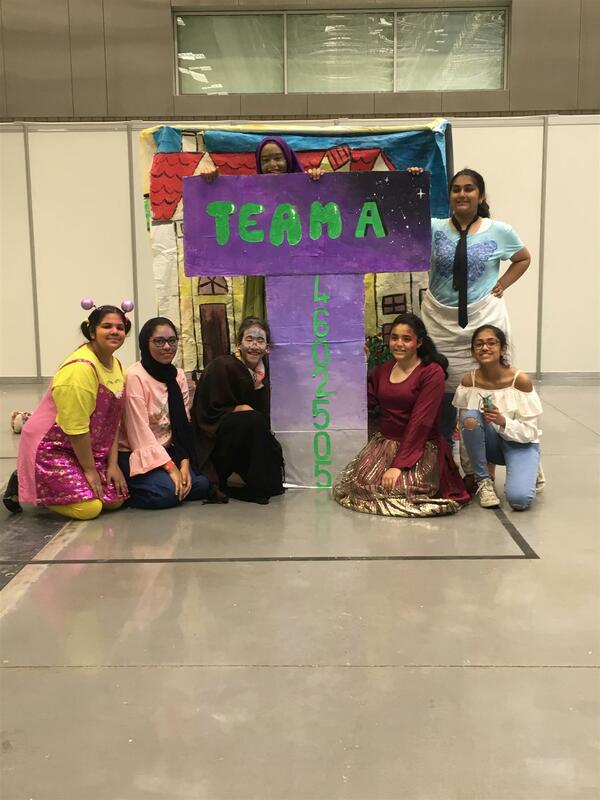 Their journey started by attending Odyssey of the Mind workshops. These workshops provided the students with skills in order to create vehicle or structure. They carried out research into what resources they would need and went to the shops to purchase their resources with a budget of $150. Time was then spent on creating their vehicles, structures, script writing and performing. Each team spend time on their projects after school and even came into school at the weekend to add the finishing touches to their projects. Finally on 25th March, the students attended the competition at the Qatar National Convention Centre. Each group showcased their project and took part in the Spontaneous task. Judges then scored the students on different areas. This year our Performance A team came third place and we are now planning to attend the World Finals in America, Iowa!!! What an amazing opportunity this will be for our students. Not only will they get the chance to perform again, but they will also get the chance to meet other students from all around the world.